For those who have never heard of “mindfulness,” it is a Buddhist meditation practice that’s emphasized in Zen Buddhism. Zen Buddhism is a mixture of Taoism and Buddhism. Practitioners claim that mindfulness is spiritually neutral. Right. And I’m Tinkerbell. Mindful meditation involves breathing a certain way, but it is also a way to transcend thinking. In fact, the mind is seen as a barrier. 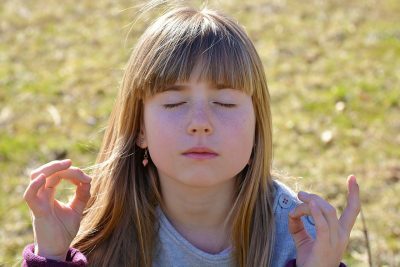 Focusing on slow breathing is meant to transcend conceptual thinking. Breathing in this way brings one into an altered state where critical thinking and judgment are suspended. In Buddhism, such thinking interferes with spiritual insight. Parents need to monitor and mind carefully what is going on in their child’s classroom. They need to ask questions about all activities! Now for the piece Harriet Crawford wrote for the Daily Mail. Meditation and mindfulness is promoted by celebrities including Gwyneth Paltrow and Russell Brand, who boast of its power to help people put stress out of their minds and live for the moment. But the treatment can itself trigger mania, depression, hallucinations and psychosis, psychological studies in the UK and US have found. The practice is part of a growing movement based on ancient Eastern traditions of meditation. However, 60 per cent of people who had been on a meditation retreat had suffered at least one negative side effect, including panic, depression and confusion, a study in the US found. And one in 14 of them suffered ‘profoundly adverse effects’, according to Miguel Farias, head of the brain, belief and behaviour research group at Coventry University and Catherine Wikholm, a researcher in clinical psychology at the University of Surrey. The shortage of rigorous statistical studies into the negative effects of meditation was a ‘scandal’, Dr Farias told The Times. He said: ‘The assumption of the majority of both TM [transcendental meditation] and mindfulness researchers is that meditation can only do one good. ‘This shows a rather narrow-minded view. How can a technique that allows you to look within and change your perception or reality of yourself be without potential adverse effects? The British study involved measuring effect of yoga and meditation on prisoners, and its findings were published yesterday in the psychologists’ book, The Buddha Pill: Can Meditation Change You?. Inmates at seven prisons in the Midlands took 90-minute classes once a week and completed tests to measure their higher cognitive functions in a ten week randomised control trial. The prisoners’ moods improved, and their stress and psychological distress reduced – but they were found to be just as aggressive before the mindfulness techniques.